Robert C. Eyberg received a Bachelors of Fine Arts from the University of Nebraska in 1972. He has exhibited paintings in New York City until moving west to Ventura, CA. He studied glass blowing at the Pilchuck School in Seattle with Dan Daily and Dale Chilhuly (America’s first National Living Treasure) in 1982. Robert taught glass blowing at Santa Barbara City College until the program closed in 1993. He has taught stained glass and etching for Ventura and Oxnard Community Colleges for ten years. Mr. Eyberg maintains a professional art studio excepting commissions for stained and etched glass, cast and fused glass sculpture and paintings. In recent years he has construct stone, steel, and glass fountains for Southern California patrons. 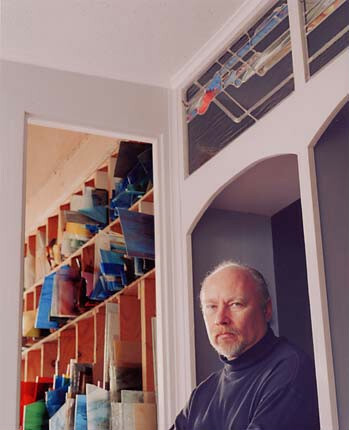 Robert Eyberg’s documentation took place in 2001. The FOTM Archive contains extensive information about this artist.